While in Paris, my friends and I decided to have a “nice French meal”. While you don’t have to necessarily spend big bucks to have such a meal, we were not French, not locals, and therefore we simply dressed up and stumbled into a nearby restaurant recommended by our concierge… and proceeded to have one of the most expensive meals I’ve ever had. My previous record was at a restaurant in the San Francisco Bay Area called Chez Panisse. It’s won countless awards as one of the top restaurants in the country and is famous for its fresh and inventive California/French cuisine. While I’ve since dined at both the restaurant downstairs and the cafe upstairs, the prix fixe restaurant was my first and pricier experience. I can’t recall exactly what we had (I was on a date) – I know there was something with chanterelle mushrooms and also a nice risotto. I do remember that my unrefined palate really wasn’t all too impressed. I mean, it was good, but not life-changing-moment-of-clarity good. Price: Over $100 for the meal, including tip. If you ever visit Berkeley in search of it, I would recommend first trying Cheeseboard Pizza and Gregiore’s instead. Top notch food, both with local fresh ingredients, without all the fuss. Back to Paris – I can’t even recall the restaurants name, so I can’t even look up to see if it had any Michelin stars. Probably not, as we got out for around $100 each, even with three bottles of nice red wine split amongst us. Now that was good. Much of the cost was probably the wine, which was also great. We also stayed there for over 4 hours, ha. I thought I took a picture of the food, but I didn’t (maybe it was all that wine?). 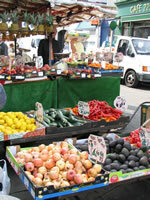 So instead the picture above is one I took of a fruit stand in the Portobello Road market in the Notting Hill area of London. So those are my only two $100+ meals to date. When I retire early, I plan on eating at the French Laundry ($200-400 easily) to celebrate. My wife and I had lunch at Morimoto in Philly a few years back. It’s Matsuharu Morimoto’s (Iron Chef Japanese) first restaurant here in the States. We both ordered the omakase (Chef’s Choice, personally prepared by Morimoto). It cost us $125 total, including the Asahi beers. That was for lunch. For dinner, the same meal would’ve cost us $200. But that was the best sushi we ever had, and we’ve been to Japan. Hoping to take the gf to Frency Laundry for V-day 2007.
and Patina some stupid “truffle” special menu which I hated. The Dining Room at Ritz Carlton in SF. ~4 hours for 8-10 courses meal with wine. I think it was $200 per person (my bf at the time paid for it so I am not sure the exact amount). My most expensive meal was at a birthday party at B. Smith’s restaurant in Washington, DC’s Union Station. Food and tip was $55. Nobu in New York. We ordered Omakase (Chef’s tasting menu) and a couple of drinks. The total was about $300 for two. I don’t think I’ve ever gone over $200 for a meal (for two), which in NYC wouldn’t be that hard to do. I don’t think food has to be expensive to be good, but I have eaten at some expensive places that were definitely worth it. And others that definitely weren’t. $300 including wine (per person), at Per Se. Worth every penny too! I hope you get to attain your French Laundry dream earlier rather than sooner, life’s too short to wait until retirement! The most expensive meal I ever had was about $130/person at Gibson’s steakhouse in Chicago – but that price includes 3 bottles of wine, desert, and several appetizers. I haven’t been to this place yet, but if I ever manage to blackmail my boss or somesuch, I’ll be celebrating at Alinea. The most expensive meal I ever had was at Ruth Chris Steakhouse in 2001. Salad, Steak, Sides, Dessert, Non-Alc Drinks + Tax and Tip $80 a person. It was good, but not $80 worth. If I take out my wife we usually spend $40 – $60 for the both of us. We aren’t into fanzy trendy restaurants. Our most expensive meal was about $180 at Morton’s steakhouse. Unfortunately, that only bought me the Ribeye. Had I gotten a decent steak and all the trimmings, we would have easily been over $250. And after the fact, I decided the Keg had better food and is 1/3 the cost. I should have waited for Morton’s seasonal special where they feed two people with steak for $99. Oh well. Once I took my boyfriend at the time out to Ten Penh for his birthday and it cost about $175 for the two of us with wine. The most expensive meal I ever went to but didn’t pay for I wrote about on my blog a few weeks ago. I’m a fairly regular reader of your blog & I’ve even acted on two of your suggestions. Not to offend you, but I sometimes have a feeling that in your chase for that first million — plus early retirement — you are missing something. There’s likely some good sense in that old saw about youth being wasted on the young. Enjoy it while you can, Jonathan, including many other $100 meals. What are you going to do with those retirement years? Golf? Tennis? Travel? Volunteer for good works? At some point you might consider disclosing to your loyal readers your ultimate goals beyond the mere accumulation of wealth. Anyway, best of luck. I can’t say I’ve ever eaten this, but if you’ve got a spare $1,000 to spend, I’ve got an ice cream sundae for you. Has anyone actually eaten at that Butter Trough place? Sounds really… weird. They need to at least add cheap beer or something. I’d rather stay at home to eat bread and butter. Is Per Se that new one in the Time Warner building? I ran across it by accident last time I was in NYC. About $200pp at Mortons in DC. Fortunatly I was on the corporate card so didn’t actually pay for it myself. Had a steak, appetizer, salad, desert, and a few glasses of wine. Was very good, but not worth $200. I think the most expensive I ever paid for myself was around $80 at a local french restaurant. My fiance and I aren’t big wine drinkers and its usually pretty hard to get up that high without it. $150 for fugu (blowfish) drinks in Tokyo. $350 prix-fixe dinner at Masa in NYC. Including sake, tax, 20% tip (automatically added) it was a little over $1K for two people. IMO, awards/ratings/stars are industry gimmics to drive traffic to top-end restaurants. There really isn’t much difference among top price restaurants. Since tastes vary, so will experiences, and I would rather look for a moderately prices restaurant that satisfies my palette and can eat there more often than a one-time hit or miss experience. I’ve been to plenty of $100+/pp restaurants and they are nice places in general, but if it wasn’t expensed/paid for by someone else, I would and have returned to only a handful of them. I can’t recall what the check was for my most expensive meal, but I’ve dined at the Oak Room in the Fairmont in Boston and that was pretty expensive. Including the drinks in the bar beforehand (for which my friend paid) it was probably close to $200 about 6 years ago. (Easter weekend 2000. It rained. I am surprised I still remember the date.) The food was fabulous and I recall having my first French Burgundy there ever. Such a great memory! had dinner for two at the metropolitan grill in seattle, wa… bill was over $200 with tip , no wine. [url=http://www.mansiononturtlecreek.com/]The Mansion at Turtle Creek[/url] in Dallas, TX. We went for our annivesary 5 or so year ago. For dinner, it was nearly $200. And I don’t even remember what we ordered. And we didn’t see anyone famous either. My wife and I have had plenty of $200+ meals, but the most expensive was $437 at the Inn at Little Washington. I had a drink and a glass of wine, and my wife didn’t drink anything. It was very worth the money. I’ve been in groups where the bill approached $2,000 for about 10 people. If the company and the service is good, go for it! York Street in Dallas, TX. $165 for two, including a $45 bottle of Mer Soleil Chardonnay. It was the finest meal I’ve yet enjoyed. I paid cash for the Carnelian Room. That was probably close to $300 since there were three of us. (Girls’ Night Out. One of my last in SF with my cousin and our friend.) I remember Rose Pistola was the scene of a $10 glass of Joseph Phelps Reserve Chardonnay. Thought that was a crazy price till I tried it. Fell in love with it right then and there. My most expensive meal was a dinner upstairs at Chateau Robuchon in Tokyo. Was about 75000 yen ($625) for two including one bottle of wine. I proposed that night, so I thought it would be a once in a lifetime experience. At the end my credit card wouldn’t go through so I ended up paying in cash. Am used to carry that amount of cash around in Japan, so it turned out fine. I live in Paris so paying 30-40 euros per person is considered average. 10-20 euros per person is affordable, and yes 80 euros is pricey but not outrageous. Really expensive places are into the hundreds of euros per person. Just come back from NY. our Anniversary Dinner cost $ 200.00 included tips. at the View (On top of Marriott at time SQ). 3 course + 2 glass of wine, which $16 each. Dinner for two at a place in Bryan/College Station, TX (where I went to school) that looked dingy on the outside but was rated 5 stars. It was called the Texan. $150 for two people. It was truly the best meal I’ve ever had, and it was one of those almost-4 hour experiences. I think it was TOTALLY worth it. I don’t remember the complete menu, but it started out with a great Caesar salad (I didn’t know Caesar salad could be great before that) and the main course was a stuffed lobster. No alcohol involved, the total was just food. I was taking my friend out who was a photographer and had made my engagement pictures for me, but wouldn’t let me pay him. Indeed, Per Se and Masa are both in the Time Warner Center. As for the concept of financial freedom, that doesn’t have to wait either. I don’t like how financial freedom to most people is an on/off switch (retirement is usually the trigger). It should be more of a gradual process. Even while young and working, one can be financially free to go trek the Great Wall if they wanted to. No one should have to wait until they’re fifty to BEGIN to experience life. I don’t really see Financial Freedom(tm) 😉 as an on/off thing. Being autonomous is simply different than having to still work. 6 years ago, spent $1000 a night in a Japanese Riyokan (inn) for the authentic experience. Obviously it was the height of the dotcom boom so we were feeling flush, money was no object and we wanted to try everything. Everything meant a full course Japanese meal at this place, which cost us around $400 a head, on top of paying for the cost of our quaint quarters and the privilege to sleep on the floor. There is very little that I enjoy in life more than a good food. My most expensive meal was probably ~$700 for 2 people. There have been a few others in the ~$500/2 range and I don’t even want to begin to think about how many there have been been in the $100-$300 range. It was $70 at the Space Needle restaurant (that’s food only; no drinks).